I tend to immerse myself in detail. I don’t get lost in them, it’s more like trekking along a long and steady trail. At the start, I know the basic direction of each piece. The details are like unknown detours along the way. I can wander off the trail for a bit, but I always keep it in sight. The series “Terra Animalia” sprung from an idea I had years ago of Hypernature, nature on steroids: sprawling and and strange and electrified. It’s like an unseen force is fueling extraordinary growth, and there’s a mysterious exchange amongst the animals that we as people can’t fully understand. I imagine the viewer as a passerby happening upon the scene, interrupting a moment that is meant to be hidden. 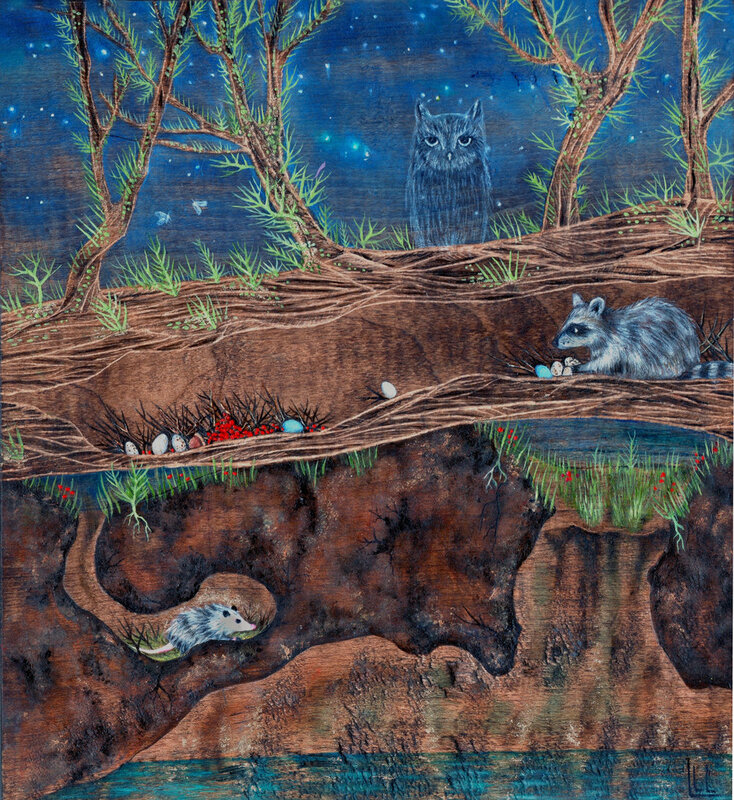 The idea of hidden views extended to my works on wood, and led me to incorporate cross sections of burrows and creatures below ground. I like to create scenes within scenes. My works on wood start as carvings, then I paint the backgrounds before coming back to painted details in the foreground. I often paint dusk or night landscapes; I find them more interesting and oil paints lend themselves so well to illumination. The color palette in my paintings is informed by observations of nature and reference photography I’ve collected. I use limited color in my works on paper, more for symbolic significance than for realistic accuracy. I recently went on a cross country road trip, which had had been on my to-do list for a long time. It was a car camping trip that would take me across the Midwest, up through Montana, Canada, and down the continental divide into Colorado. I had a few places in mind that I knew I wanted to see, and a loose route that I would take. It was a trip to see places I had been to as a child, and again as an adult 20 years ago. This trip would mirror in many ways how my parents had done our earlier family trips. My father always seemed to find places for us to camp every night without having a set itinerary. Sometimes during a day of traveling he would look at his maps, and have options for how far we would go and what we might find when we got there. As far as I could tell and remember, it always worked out. My mother ran all the meals, and had a way of keeping things organized. A dry food-box, a cooler, and another container with all the dishes and pots-and-pans. We were completely independent and a self-contained group. Everything we brought had been pared down drastically to what was our essential needs, and yet we never felt like we were going without. So, as I set out in my car with a tent and the bare necessities for a minimal way of life, I made no reservations. I wanted to be flexible with where I was going and how I got there. I did wondered at times if I would be sleeping in my car, but that never happened. As it turned out, I had the most amazing trip, and along the way I reflected on what I was doing to make the journey such a success. I am a friendly person, and am grateful to all those along the way who guided me to their favorite special places that I would have missed without their help. I also realized that finding the enjoyment in the trip had to do with making good decisions, which reflected what I wanted and needed at any particular moment. It was at those moments in which I checked in with myself to see what I wanted to do next. That in the moment decision would determine the right direction for me to go. I didn’t have to worry about anything except how to be happy. My whole purpose was to make sense of how to feel fulfilled. It was life minute by minute. My reflection on this process of creating a good life for myself is something I have thought about in relation to my art making process. What is the purpose of setting out on a trip? I had hopes of making a place for myself wherever I went. This process seems to be the same when I begin a new piece, and how I bring that piece to completion. The force of a work of art is in its internal logic, and the decisions I make that make sense to me, with an outcome that hopefully makes sense to the viewer. When I begin a new piece, I know where I want to go with it, but I don’t know the route I am going to take or the particular places I will go to as I go along. It’s the confrontation with a blank piece of paper that I know I want it to make sense of and have some impact in its essence. Through the process, I have to go to places I hadn’t planned on in order to find what is there for me to ponder. There has to be questions as to where to go next in order to find the way forward. Knowing the end point and planning out in detail how to get there takes the pleasure out of the journey, and the joy of discovery out of my work. All of this is done by decision making that allows the piece to create itself through my process. Looking at the map, and the multiple ways to go forward is the way to take the road less travelled, and it’s the surprises that will be found on that road that is exciting. Each decision leads to a new place, and the culmination of those decisions leads (hopefully) to a finished piece that reflects the depth of my journey. The greatest creation I get to make is how my life is lived. I want my art to reflect that same connection with myself, and the journey. Growing up as a child, in upstate New York, our summer vacations were visits to our grandparents Martiny Brothers Farm and stays at lake cottages with fishing galore. Sunfish and perch were the usual catch prompting future images of water, beach, and foliage. It wasn’t until the late 1960’s that I came to Boston’s North End after Graduate School at Cranbrook Academy of Art in Michigan. Once I saw the Atlantic Ocean, and was captured by the strength and nuances of rock, sky, and water, I never wanted to go inland again! My drawings from the 1980’s use a limited palette of black, white, and grays set on a warm umber ground. There are inscribed forms on rag paper within a golden wash like prehistoric remnants of animal, plant, and stone–the stuff that beds the world under the sea. I work very intuitively. After inscribing the forms, I tone the paper like a printmaker wiping a plate. When it has dried, I sit and wait for images to suggest themselves. I then begin to draw with oil-sticks from memory, photos, or life models. Two drawings in this show, Holding Back The Fear Of Rushing Water (with its bewildered man encircled by rocks, fish, and sea creatures), and Expulsion (with a water-spewing Fish over a man bowed by a fertile sea) dramatize the drama of external landscapes and internal musing. Through the last thirty years, I’ve used both abstraction and realism in my work. In the 2000’s, Righting Moment, charcoal drawings I rendered humans again at sea in refreshing or darker waters. My 2013–2014, Gaze….An Extension Of The Heart were very realistic charcoal drawings of eye-engaging men–emotions filtered through their face and stance. During 2014-2015, I painted with acrylics and molding paste on clay-board in my Fossil Fantasies body of work. As many species evolved over millions of years and others disappeared, we remember that we are all but a fragile presence on the planet’s shell.